This exceptional composite horn and sterling silver set consists of a claret jug and six beakers. 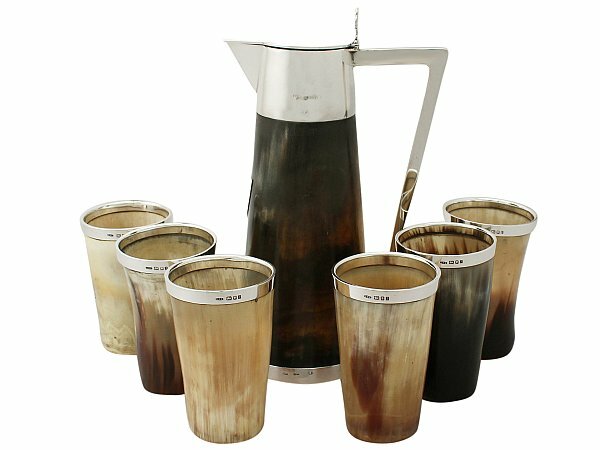 The impressive claret jug and beakers have cylindrical tapering forms; the beakers are crafted from natural horn therefore bear subtly differing shapes and sizes. The cylindrical neck of the claret jug is fitted with a fine and impressive plain sterling silver hallmarked mount with a hallmarked hinged cover. The cover is surmounted with an impressive pierced decorated interlacing scrolling thumbpiece. This antique lidded jug is fitted with a plain angular handle. The natural body is ornamented with an applied hallmarked sterling silver shield shaped vacant cartouche. This versatile Victorian jug could be functionally used for wine, cordial or water. The beakers are fitted with the original hallmarked sterling silver borders to the rims. Each piece was assayed in London: the claret jug was crafted by Henry Titterton Brockwell of Brockwell & Son and the beakers feature the hallmarks of Christopher Nigel Lawrence. This antique jug and beakers are a very gauge of silver, excellent quality and in excellent condition, in keeping with age. The horn vessels are in perfect condition. Full hallmarks struck to the surface of the mounts to the beakers are all very clear. The full hallmarks to the surface of the mount of the claret jug have wear in keeping with age and have not been struck clearly due to the gauge of silver; the part hallmarks to the interior of the cover and cartouche remain very clear in keeping with age. Reflections in photographs may detract from the true representation of these pieces of antique and vintage silverware. Length from back of handle to tip of lip 14.2cm/5.6"
Height to top of thumbpiece 23.2cm/9.1"